It’s the 7th of May and I’m calling you from Pangboche. We woke this morning to see high clouds over the distant high peaks such as Everest, but Ama Dablam was clear top to bottom. We enjoyed looking out and trying to identify climbing features on Ama Dablam after breakfast. 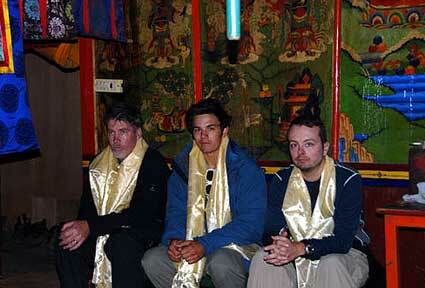 In the late morning we walked to upper Pangboche and visited Lama Geshi. 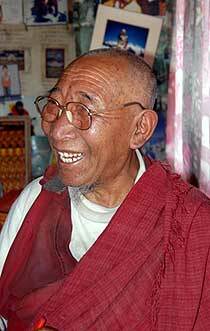 Lama Geshi has been an important friend of ours for many years. He has blessed our climbing expeditions and treks and we feel that we have a long standing close relationship with this really powerful and spiritual man who is very important in this part of the Khumbu region. He blessed our Everest 2006 expedition which had great success with 14 people reaching the summit of October 18th last autumn. In case you are wondering, Johnny went up to see Lama Geshi as well. When Lama Geshi met Johnny he broke out in that beautiful smile of his and laughed. He began to tell us that Johnny’s name is Sanskrit is Haans and what a wonderful bird he is. He described that in Tibetan beliefs birds are especially important and considered righteous because they don’t kill anything, they eat meat they find but they never take another life. He also carefully looked at Johnny’s webbed feet and explained to us that this was a symbol of power and luck in Buddhism. The Lama Geshi as he always does spent some time blessing each of us and we really enjoyed spending a quiet, peaceful time with him. Now we are moving on to Pheriche at 14,000 feet (4266m) and I just spoke with Kathmandu and Brad arrived very early in the morning on his flight from Lukla and he’s resting at the Yak and Yeti. The group is doing great; we’re meeting wonderful people and are really enjoying trekking toward Everest Base Camp.